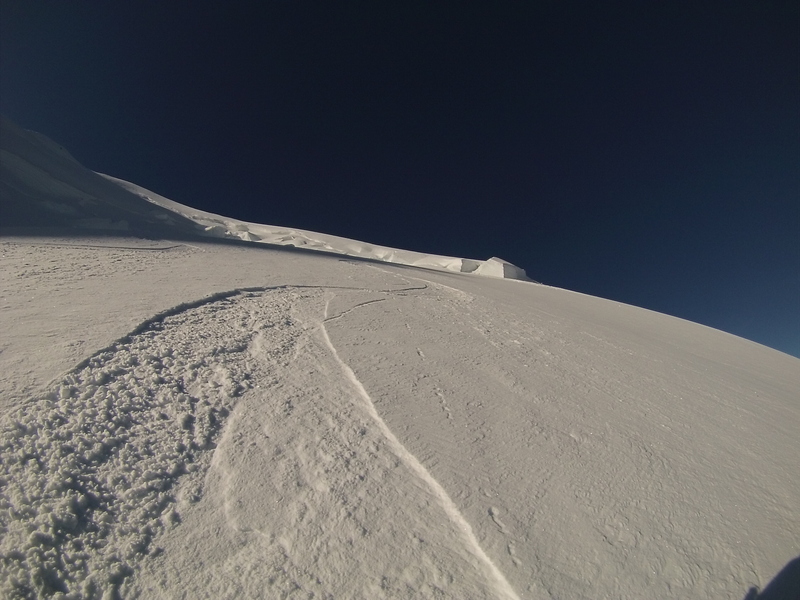 After turning back from the summit of Mont Blanc du Tacul on saturday I was determined to go back and bag it. 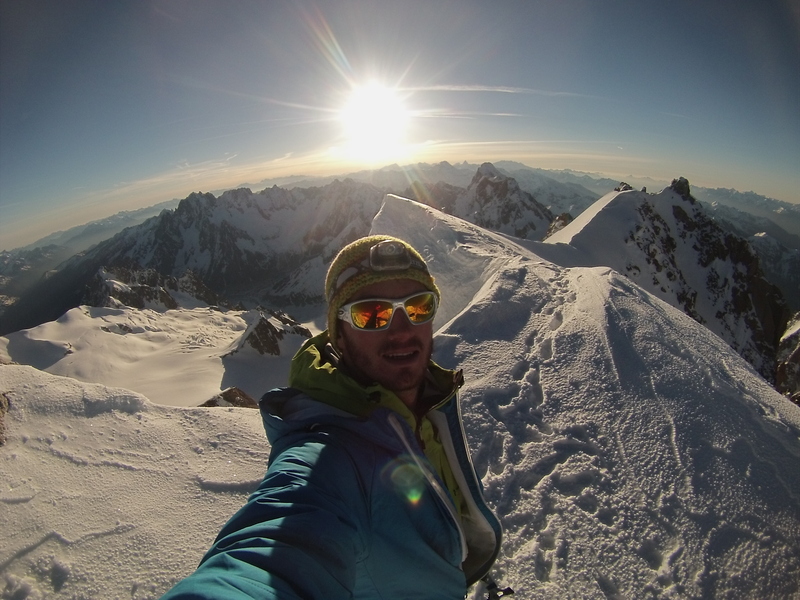 Finishing work early on Wednesday I headed up the Aiguille du Midi to bivi at the Col so I could get an early start. I was thinking that if I was feeling good I would have a crack at Mont Blanc! 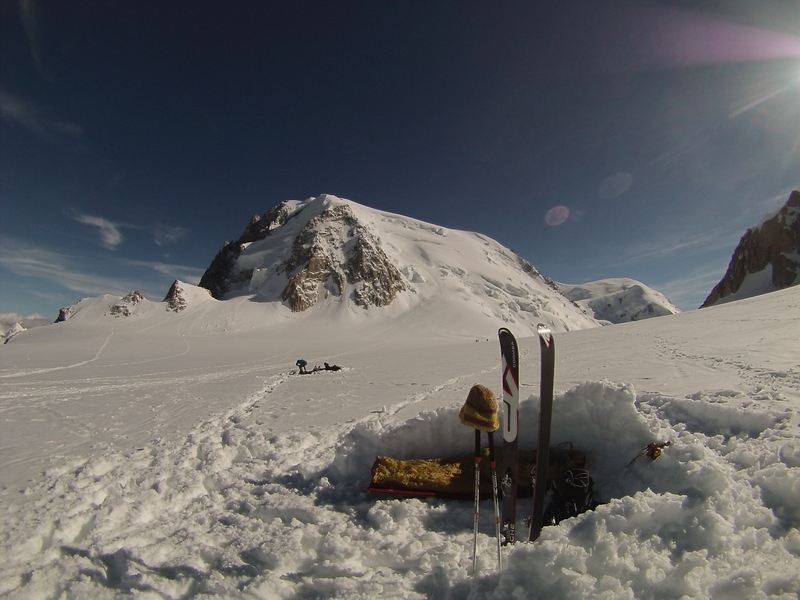 After skiing down the arete I soon found a nice bivi spot that someone had left and settled in for the night with a wake up time of 3:45am. The Bivi gave me plenty of time to look at the face again and scope out the best possible ski line down so I could get most of the untouched snow. My decision to bivi was rewarded with a stunning sunset, with all the higher peaks turning their usual pinkish red. 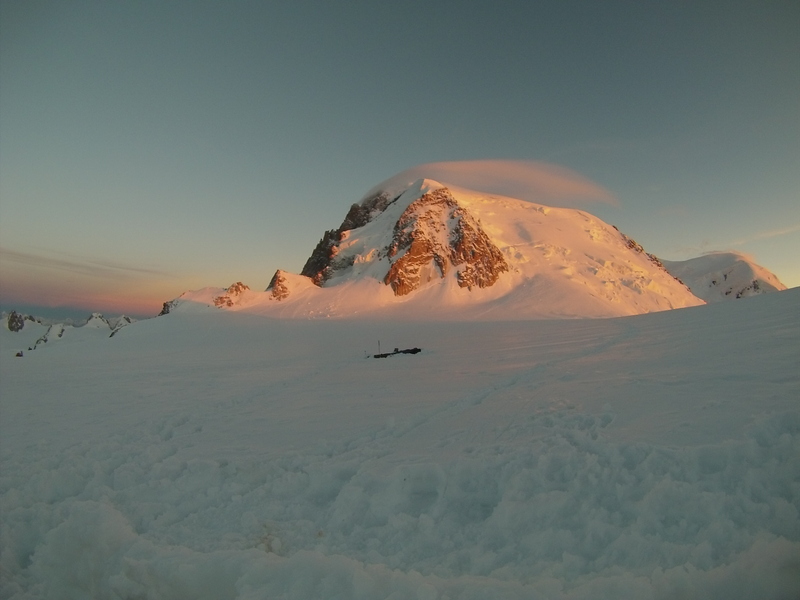 It rained earlier in the week and this put down a fair bit of snow up high and a friend had skied the Gervasutti Couloir on the Tuesday and said it was nice powder up on the north faces of the Tacul and Maudit. Leaving the bivi just after 4am there were already dozens of head torches working their way up the Tacul, mostly on skis but there were some parties who were heading for Mont Blanc on foot. 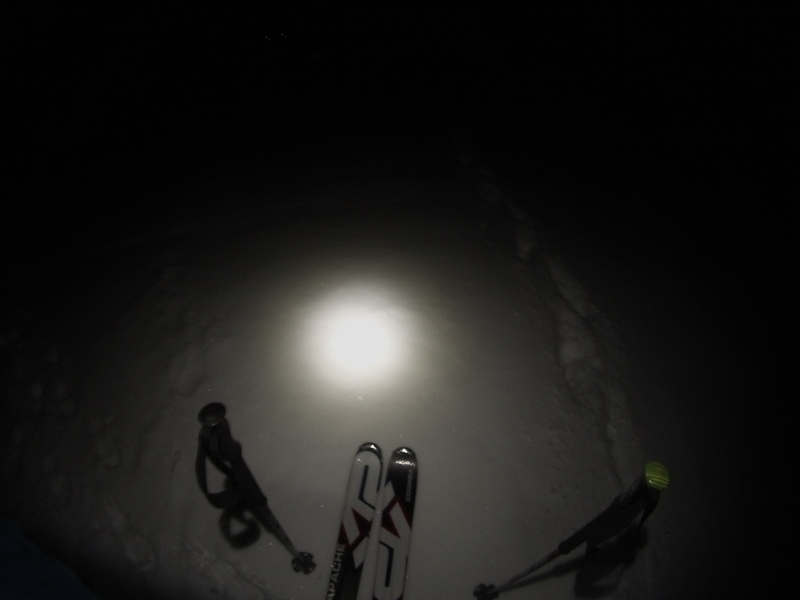 I made quick progress in the dark and soon reached the Bergschrund. Starting off in the dark is great. You have more of the day and you don’t get too hot starting out. It does mean you have to take more care in your route as you may not see things that you would in daylight. Just over a third of the way up the face I was having trouble with my skins sticking and my skis staying on the skinny track, after using a lot of extra energy trying to pull myself up I decided to just put crampons on, skis on the back and carry on up the walking path which was firm and well travelled. The sun started to rise about 5:30am when I was just over half way up the face, this was nice as I could see better and the warmth gave me a little extra spurt of energy to push on to the top. I hadn’t settled to the altitude as well as I would have hoped to and was starting to get a headache so made the decision that I would just go to the summit of the Tacul and then head back down. There is a small mixed climb to get to the summit, about 50m, and as I was on my own with no rope I did bring two axes which made it easier as there were some tricky moves with long run outs below, two axes also made down climbing after a lot easier and safer. 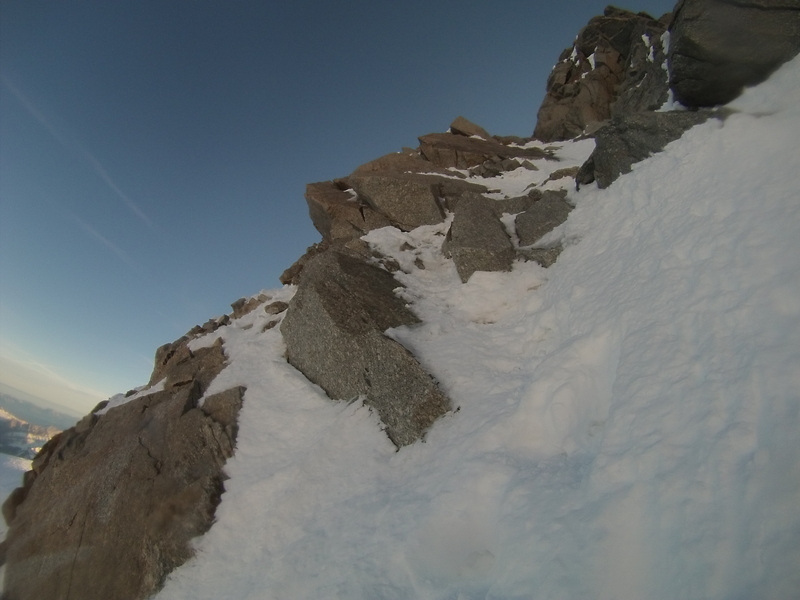 A small part of the summit climb, photo is taken with GoPro which takes away some of the steepness. On the summit for 6:30am I found I was quicker than saturdays attempt and the sun was well and truly up by now and I sat on the summit for 20 minutes soaking up the sun and taking in the views. I was pleased to have climbed the Tacul after failing due to weather on saturday. Next comes what all the effort was for…The Skiing! Putting my skis on just below the rocky summit the snow was hard pack and quite wind affected for the summit ridge, this soon changed as I dropped into the North Face, It was two day old powder with a very thin breakable crust on and there was loads of fresh! As I was on my own I didn’t get a photo of any skiing and as I went light I didn’t take a helmet so no p.o.v pictures. All I managed was a little photo of some fresh turns I made on the lower half of the face. It was a little less deep here than up higher but it was really nice snow, I didn’t want to attack it with full speed as the parts that I had decided to ski were above the larger parts of the Bergschrund and some large seracs, but that was where the best snow was to be found! 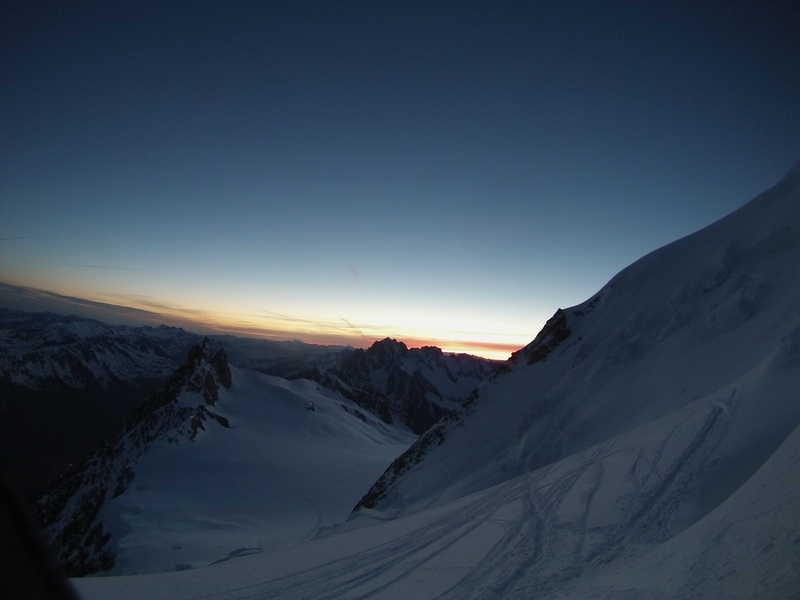 I was back down to the bivi about 7:45 and after packing up my gear headed up the arete to the Aiguille du Midi to go back to town. There were hoards of people coming down the arete and thankfully they all gave way to me, partly because they could see I had little energy to notice them let alone move aside! On to the 8:45 bin and back to town for just after 9am! Is it too early for a well done beer? I am glad I set off early as I am writing this at 12pm and its over 25’c in Chamonix, It would be roasting if I had set out from first bin!